South American football president Nicolas Leoz has resigned from Fifa's powerful executive committee on "health and personal" grounds. Leoz was accused by the BBC's Panorama programme in November 2010 of taking bribes in the 1990s from the now defunct sports rights agency ISL. The 84-year-old, who denies the claims, has been ill for some time. His resignation comes in the week that a 4,000-page report by Fifa's ethics investigator is set to be made public. A file prepared by investigator Michael Garcia was passed to Hans-Joachim Eckert, the world governing body's ethics judge, several weeks ago. Eckert may also make recommendations for further action to be taken against serving Fifa personnel based upon the report. In 2011, former Football Association chairman Lord Triesman alleged that Leoz had asked for a knighthood in return for supporting England's bid to host the 2018 World Cup. 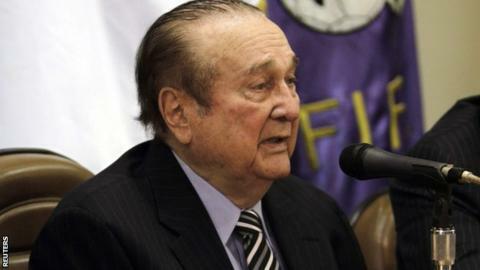 Leoz, who is also set to leave his role as president of South American football confederation Conmebol, denies Triesman's claims. It was later reported that an aide to Leoz proposed to the England 2018 bid team that the FA Cup should be renamed in his honour in return for him agreeing to visit England. Responding to the resignation, a Fifa statement read: "In accordance with the Fifa statutes, Conmebol will now have to decide immediately on the replacement of Nicolas Leoz as one of its representatives on the Fifa executive committee for the remaining period of office." The news comes a day after Fifa adviser Alexandra Wrage resigned in protest over her belief that anti-corruption proposals to reform the organisation have been watered down.